Monte Carlo methods (or Monte Carlo experiments) are a broad class of computational algorithms that rely on repeated random sampling to obtain numerical results. They are often used in physical and mathematical problems and are most useful when it is difficult or impossible to use other mathematical methods. Monte Carlo methods are mainly used in three distinct problem classes: optimization, numerical integration, and generation of draws from a probability distribution. In physics-related problems, Monte Carlo methods are quite useful for simulating systems with many coupled degrees of freedom, such as fluids, disordered materials, strongly coupled solids, and cellular structures (see cellular Potts model). Other examples include modeling phenomena with significant uncertainty in inputs such as the calculation of risk in business and, in math, evaluation of multidimensional definite integrals with complicated boundary conditions. In application to space and oil exploration problems, Monte Carlo based predictions of failure, cost overruns and schedule overruns are routinely better than human intuition or alternative “soft” methods. The modern version of the Monte Carlo method was invented in the late 1940s by Stanislaw Ulam, while he was working on nuclear weapons projects at the Los Alamos National Laboratory. Immediately after Ulam’s breakthrough, John von Neumann understood its importance and programmed the ENIAC computer to carry out Monte Carlo calculations. Being secret, the work of von Neumann and Ulam required a code name. A colleague of von Neumann and Ulam, Nicholas Metropolis, suggested using the name Monte Carlo, which refers to the Monte Carlo Casino in Monaco where Ulam’s uncle would borrow money from relatives to gamble. Using lists of “truly random” random numbers was extremely slow, but von Neumann developed a way to calculate pseudorandom numbers, using the middle-square method. Though this method has been criticized as crude, von Neumann was aware of this: he justified it as being faster than any other method at his disposal, and also noted that when it went awry it did so obviously, unlike methods that could be subtly incorrect. Why do we say Data Science? is this a part of the Science? if you think as an Statistics or Engineer it’s difficult to understand. One of the most beautiful things in the earth is the nature. We don’t think about that but we are rounded about nature inspired objects, for example planes (like birds), buildings (like hives) or submarines (like whales). When we talk about the Computer World we have also looked at the nature world to learn how to find the best solutions to the most difficult problems. In the Data Science Universe, more concretely in the algorithm side, we have interesting nature oriented solutions from fields like Neural Networks or Genetics or Swarm Intelligence. Is really interesting thinking in how to find algorithms that emulate Neural Networks to solve daily problems we have, or look at the bees or ants to use Swarm Intelligence and replicate this behaviour to apply solutions in Healthcare or Public Administration to improve the quality of live of the people. This is my main objective try to give VALUE to the society and through the Data Science Universe I believe that it’s a reality! Here you find examples of biological systems that have inspired computational algorithms. Also in this blog you find more detail with examples around Algorithms in Nature.Turnig back to this post I focus in the Genetics Algorithm, in other posts I will talk about other Nature Algorithms. Computer science and biology have enjoyed a long and fruitful relationship for decades. Biologists rely on computational methods to analyze and integrate large data sets, while several computational methods were inspired by the high-level design principles of biological systems. Biologists have been increasingly relying on sophisticated computational methods, especially over the last two decades as molecular data have rapidly accumulated. Computational tools for searching large databases, including BLAST (Altschul et al, 1990), are now routinely used by experimentalists. Genome sequencing and assembly rely heavily on algorithms to speed up data accumulation and analysis (Gusfield, 1997; Trapnell and Salzberg, 2009; Schatz et al, 2010). Computational methods have also been developed for integrating various types of functional genomics data and using them to create models of regulatory networks and other interactions in the cell (Alon, 2006; Huttenhower et al, 2009; Myers et al, 2009). Indeed, several computational biology departments have been established over the last few years that are focused on developing additional computational methods to aid in solving life science’s greatest mysteries. But, What is a Data Scientist? 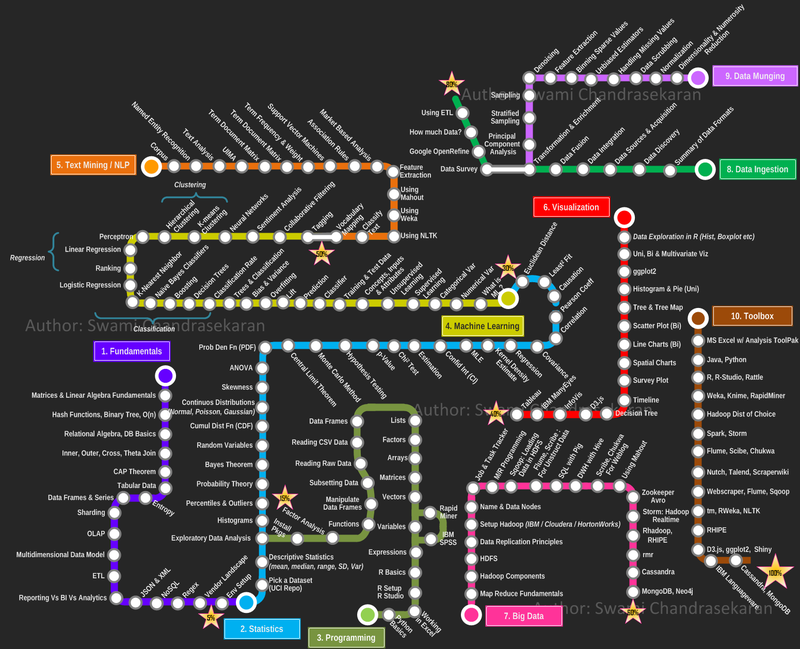 I have started explaining how to become a Data Scientist, but … What is a Data Scientist? Is there an Official University or Professional career with this name? Do you need a Certification to show your skills as a Data Scientist? What are the main skills that you need to be named as a Data Scientist? Data Scientist is one of the latest emerged jobs and maybe the sexiest job of the century as you can see in detail in this Forbes article. A really funny description of Data Scientist I have founded in a tweet: “Person who is better at statistics than any software engineer and better at software engineering than any statistician”. Then, do you need to study Statistics? Do you need to study also Software Engineering? Is there a career about Data Science?